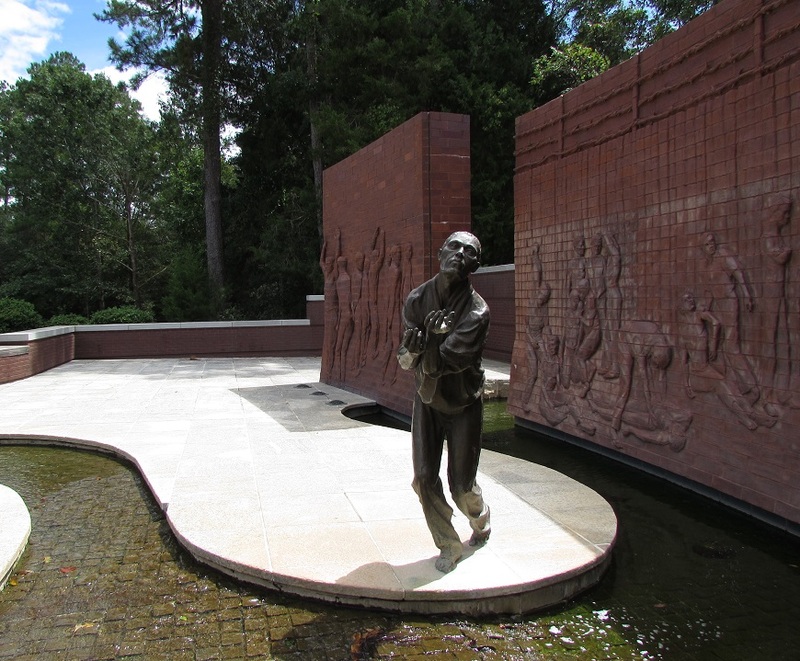 Andersonville National Historic Site is home to the National Prisoner of War Museum. It opened in 1988 but I’d never heard of the museum until I got to Andersonville. It’s located in the Andersonville NHS Visitor Center. It tells the story of American POWs starting with the Revolutionary War. I expected the exhibits to go chronologically, but they don’t. They are grouped into themes: capture, living conditions, news and communications, morale and relationships, escape and freedom. Living conditions: Look through the slot, said a sign on a wooden door in the exhibit area about living conditions during the Vietnam War. I lifted the small flap — like the mail slot in a house door — and looked in. It was pitch black. “Aim your camera in there and take a flash photo,” suggested Mr. History Tourist. I did, and above is the photo I got. 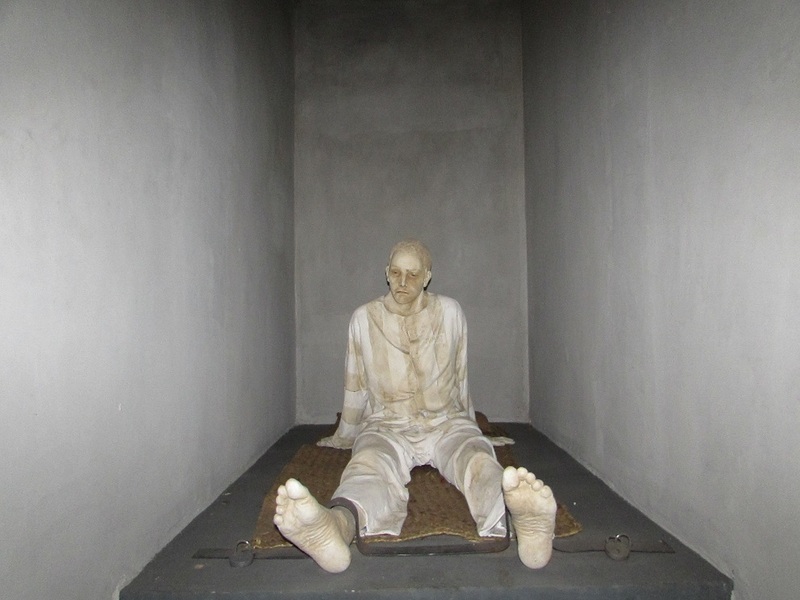 I thought maybe that was the point of the exhibit – that prisoners sat in a pitch black cell. But seeing descriptions from other visitors, I think the light just wasn’t working that day. Morale: The Bataan Death March was a 60 mile journey of starvation, beatings and other abuse across the Philipines for approximately 75,000 American and Filipino soldiers. By the time they got to their destination, a captured US Army facility turned Japanese POW camp called Camp O’Donnell, about 60,000 were left. Another 1600 American and 26,000 (yes, that’s not a typo — 26,000) Filipinos died at Camp O’Donnell during its 9 months as a POW camp. As hundreds of POWs died each day, the Japanese gave the American senior officer a sack of cement with the command to make a shrine for the men who died. Instead of the Shinto shrine that the Japanese expected, the Americans erected a cross. 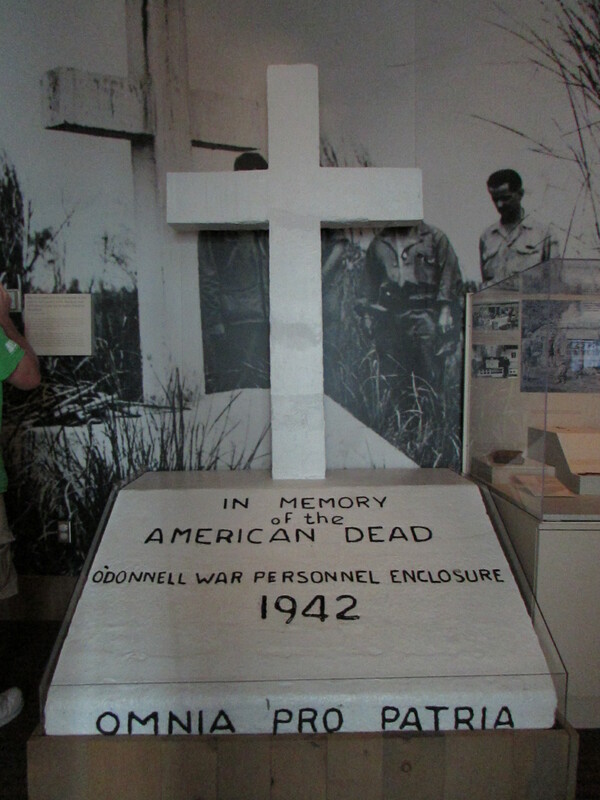 The exhibit description says, “Fittingly, the inscription did not contain the word “prisoner,” reflecting the men’ refusal to concede anything to their captors.” The cross was presented to the museum by the survivors of Camp O’Donnell. He rejoined his regiment after his release from Camp Sumter and, when they were sent after Booth in the aftermath of the Lincoln assassination, claimed responsibility for shooting Booth. Eyewitnesses contradicted his claim but his reputation as “Lincoln’s Avenger” seems to have stuck. After he was discharged from the army, he tried to make a living as a preacher and on the lecture circuit, though his erratic behavior and incoherent speeches made him less than popular. Eventually, based on his rep as Booth’s killer, the Kansas House of Representatives gave him a job as their assistant door keeper. Less than a month later, he threatened coworkers with a gun in a delusional fit and was arrested. Declared insane, he was sent to the Topeka Asylum for the Insane from whence he escaped and disappeared from history. Gallery | This entry was posted in Georgia. Bookmark the permalink. Aaarg! I missed the part about the women at Andersonville. That’s what I get for not seeing the movie. I was recently at the Holocaust Museum and wondered exactly that: is it better to have died or live through a situation like that (and come out not completely whole). Something people who have never faced the situation will, I’m sure, never know. I don’t think the part about the women was in the movie. I remember it being a very brief couple of photo/plaques in the hallway. I almost missed them. Yup — I missed it all. 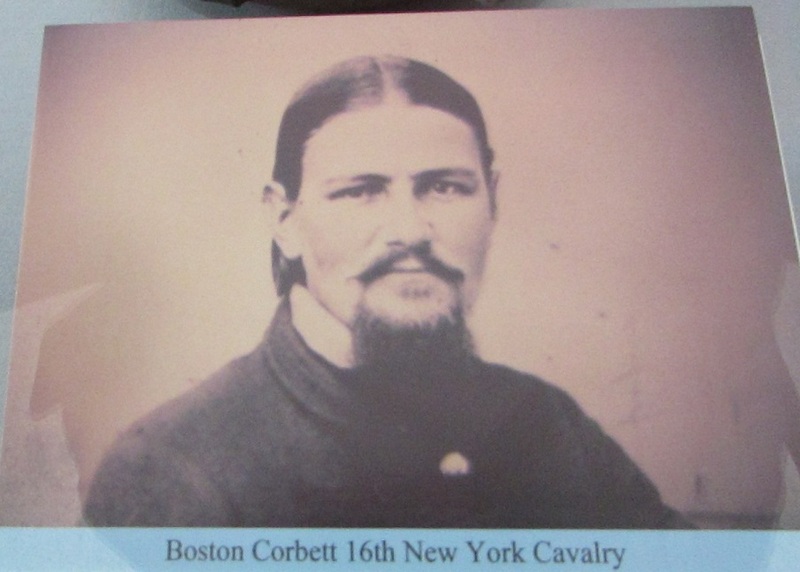 Boston Corbett looks rather like Rasputin! Now that you mention it…. I thought exactly the same thing! Sounds like a similar personality type too. Hmm, let’s see … Boston Corbett disappeared around 1894. And Rasputin appeared at the royal court about 10 years later …. Explains why no one could find Mr. Corbett.